It's that time of year again....here's your Christmas gift! - Stop staring and start sewing! It's that time of year again....here's your Christmas gift! I had the hardest time coming up with a tutorial gift idea this year and finally it hit me (and I'm so grateful because I was drawing a complete blank)! 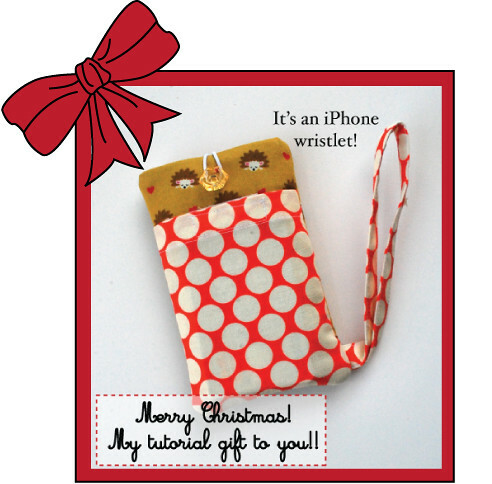 So here is my gift to you, my dear reader bloggy friends...a tutorial for an iPhone/iPod wristlet. I know not everyone has an iPhone but it seems like every other person I know got one this year so maybe I can take care of half my gifts this way and you can too? It takes very little fabric and I've used felt for the padding because I love the way it works for little projects like this (and batting tends to fluff up my nose and make me sneeze sometimes). You are free to use batting if that's what you've got on hand (just keep your tissues nearby). Just use the link at the top of this post to downloade the file (it's 6 pages of detailed photographs and instructions). 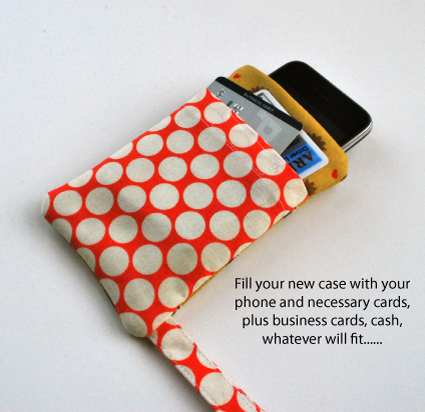 The pocket is for stowing your necessary cards when you want to go out but don't want to take your whole purse (you can fit a few bucks in there too). Let me know what you think! And if you make some please add them to my flickr group! Have a wonderful Christmas season and don't fret yet, you still have plenty of time to get your shopping and baking done!